Jim Papoulis Coming This Week! How lucky we are to be hosting an internationally known composer who has worked with so many famous musicians, in so many diverse performing arenas, and across so many countries! I must have confirmations for the Songwriting Workshop this Thursday AS SOON AS POSSIBLE or you may not have food! Click here to view the form so you can download and print out, OR email dickersonchorus@gmail.com and let me know if you are attending. If you do NOT receive an email from me later today, that means your form has been received. 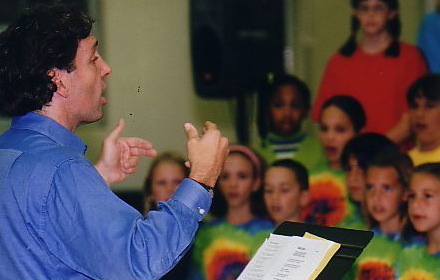 Internationally known composer and conductor Jim Papoulis will teach the Dickerson Middle School Chorus students the basics of song composition. Through a process that involves hands-on collaborative work with vocal exercises, rhythm, lyrics, and instrumentation, students will compose a song that will then be premiered at the Dickerson Chorus combined spring concert!